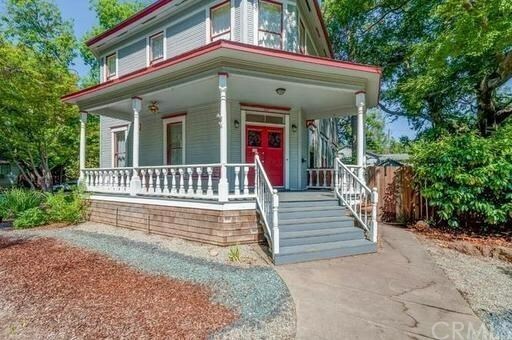 This historical Victorian home is located in the heart of Chico and a stones throw away from Chico State, Enloe and Downtown Chico. Make this beautiful home your own or use as an investment property. Rent out a few rooms here or there to cover your mortgage all while having PLENTY of room for your private space. It has been used for both! As a former bed and breakfast, this well-crafted 8 bedroom, 3.5 bath home is now fully leased bringing in an annual gross income of $54,600. This 2900+sq. ft. home still retains the charm and character it was built with. From the front porch overlooking the neighborhood, to it's beautiful double-entry doors, up it's grand wooden staircase to it's rooms with double-hung windows, tall ceilings and transom windows, this home is sure to delight. The updated HVAC units are zoned for upstairs and downstairs and operate very efficiently with The Nest thermostat, keeping the electric bills between $130-$310, even in the hot summer months! There is a HUGE basement that can be used for all the additional storage you may need. The backyard and side yard are fully fenced and they offer plenty of room for outdoor fun and gardening. Possibilities are endless! Directions: On E. 1st Ave one block away from esplanade. Selling Office: Coldwell Banker Ponderosa R.